Almost immediately upon gaining independence, India experienced a major threat to national unity and stability. The country prepared to divide along the borders of two of its rare overlapping cleavages to create a separate Pakistani nation with a Muslim majority (one in the west corresponding to the borders of presentday Pakistan and one in the east corresponding to present-day Bangladesh).31 Though one might view India's Partition—particularly when considering the massive violence between Hindus and Muslims that accompanied it—as a mark of extreme political instability, interestingly, the partition has seemingly effectively dealt with India's overlapping cleavages. Indeed, the cleavages that remain are essentially cross-cutting (with the exception of Kashmir), rendering a relatively stable contemporary Indian nation. Thus, the partition not only dealt with two of India's cross-cutting religious cleavages, but it also promoted political stability by leading to a greater empowerment of the central government. Indeed, India has enjoyed relatively peaceful political relations and stability since then, whereas most of Nigeria's political instability both historically and today stems from its intense regional competition (often over resources), which might not exist had Nigeria similarly experienced partitions or secessions of particular regions. However, in Nigeria, partly due to unequal resource division, secession of any of the regions is highly unlikely. 1967 did see the attempted secession of Nigeria's Eastern Region, an attempt that "ballooned into a 30-month civil war…that caused more than two million Biafran deaths—mostly children".34 This bloody conflict serves as further evidence of the instability and violence that is all too prevalent in Nigeria and of which ethno-regional competition is a direct cause. Paradoxically, Nigeria's heavy endowment with natural resources is the very reason secession, which is typically a very destabilizing event, is unlikely in Nigeria— yet, the existence of these natural resources is concurrently the chief source of its political instability. Nigeria is one of many in the ranks of those countries suffering from a "resource curse"— for Nigeria, it is primarily oil, referred to as "the curse of black gold".35 Indeed, Nigeria possesses over six times the oil reserves that India possesses (U.S. EIA). In relative terms, Nigeria's sizeable oil resources are even more marked considering that India is over seven times as populous and over three and a half times as large geographically as Nigeria is. Because India has never possessed a comparably abundant, coveted natural resource, its leaders have long been invested in its population being productive. Indeed, as Sil summarizes, "India's GDP growth has come from all sectors, ranging from agriculture and manufacturing to services and information technology".36 Reliance on service sectors has also led the government to invest in its population's education, a trend not paralleled in Nigeria. Nigeria's leaders, on the other hand, have not needed to concern themselves with having a productive population. The result has been that strong relationships have not been promoted among leaders and the population at large because the population is often "bought off" using oil wealth in return for stability. Early Nigerian ruler Ibrahim Babangida, for example, was known for "buy[ing] off opposition…with state largesse and outright bribery," a practice that came to be known as "settlement" and that became so ubiquitous as to be "turned into a national pastime by subsequent regimes".37 Unsurprisingly, this practice of buying off opponents and disgruntled populations has led to instability in many cases when oil prices have fallen and oil wealth could not be used in such a way. 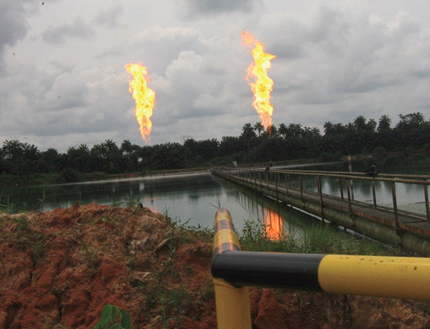 Despite abundant experience with domestic instability, Nigeria's leaders have not developed effective ways of dealing with restive populations and instead have resorted to—and continue to resort to—repression and violence.38 Oil has been a further source of increased instability because oil resources are concentrated in the South. This further polarizes and reinforces ethno-regional identities and drives regional competition. Even though the natural resources that India possesses are also for the most part regionally concentrated (for example, its oil, natural gas, and uranium), this fact has not become a source of regional competition in India largely due to its strong central government that controls the allocation of its resources and the allocation of revenues from its resources. Also significantly, Nehru's vision of the new Indian nation was characterized by secularism. Importantly, in the context of India, secularism implies opposition to communalism. As Sil writes, "Aside from the formal equality of all citizens before the law, secularism in India implies that politics should revolve around the interests of individuals rather than of groups identified by the communal ties of caste, region, or religion".44 Thus, India's secularism has served to further deemphasize potentially divisive group identities in favor of more nationalistic principles centered on individuals.viii Also significant for the purposes of this paper, India's understanding of secularism has led to its institution of a "reservations" system, a formal system aimed at leveling the playing field for minorities and previously disadvantaged groups; Sil describes this system as "India's version of affirmative action".45 This policy has thereby allowed India to accommodate in important ways its Muslim and other minority religious populations as well as members of its lowest castes. There is no comparable "reservations" system in Nigeria, for the protection or privileging of minority and disadvantaged groups, which perhaps partially explains the commonness of the extralegal actions taken by minority tribes (e.g., the aforementioned Ogoni uprising). In contrast, upon gaining independence Nigeria pursued a course that merely continued to build upon colonial legacies. Primordial identities and the dominance of local strong men were reinforced as regions retained and continue to retain their immense political power relative to the center. Nigeria has also retained its ethnoregional political parties and separate models of suffrage for the North and South. Even in its attempts to economically "minimize the vestiges of neocolonialism and the country's dependency" on foreign corporations through such measures as the Nigerian Indigenization Policy, the "most enduring consequence" of such policies has instead been "the politicization of Nigerian capitalism, in that one section of the country, the Yoruba, benefitted the most…and the worst hit were the Igbos." Furthermore, the mixed-economy policy only "became a conduit for capital accumulation by the political elite".50 Thus, preexisting differences have merely been exacerbated by Nigeria's economic policies, which have layered socioeconomic disparities atop them. As mentioned, Nigeria continues to lack a strong central government, and acts made by the central government often generate discontent from significant proportions of the population. Hostility largely stems from mistrust of government leaders belonging to a different ethno-regional group, and this frequently lead to coups and violence. The persisting importance of ethno-regional parties is evidenced by the unofficial "zoning" agreement that has been adopted in Nigeria, providing for a rotation of the presidency every two terms between the North and the South. This practice demonstrates the "ethnic mistrust" embedded in Nigeria's pluralism that has "informed the need to assure every major group of a turn at the presidency and other top posts".51 Today, local tribes are even more visible and active, especially in conflicts over oil (e.g., again, the aforementioned Ogoni uprising). Recently, several East Asian countries have undergone rapid economic growth and have experienced remarkable political stability throughout the process. The achievements of these nations—most prominently the "Asian Tigers" of Taiwan, South Korea, Singapore, and Hong Kong— have garnered attention, prompting discussion as to whether their practices may provide a generalizable model" that could be adopted and implemented by struggling developing nations elsewhere in the world.ix Notably, in the context of this paper, they have also experienced colonialism and are plagued by its common legacies—indeed, Singapore and Hong Kong even share with Nigeria and India a history of British colonization. (Alternatively, Korea experienced Japanese colonization, and Taiwan had a number of colonizers, of which England was not one.) However, I assert that it is highly doubtful whether these nations could offer a model that could successfully be applied to Nigeria or India, given certain inherent features of these nations and certain structural features that now exist. The inherent and extreme diversity of Nigeria's and India's populations presents a potentially insurmountable obstacle to successfully implementing the East Asian model. Firstly, the inherent and extreme diversity of Nigeria's and India's populations presents a potentially insurmountable obstacle to successfully implementing the East Asian model. Part of the reason the model—which is characterized by central planning under authoritarian rule— works well in East Asian countries is because it is functioning in a homogenous society, which makes trust of leaders less problematic and makes having unified goals (two essential prerequisites in order for this model to function) much easier. Furthermore, in India, which already has a functioning and relatively stable democracy based on coalition politics, one might question whether a move toward the East Asian model would even be an improvement. Rather, it seems regressive— at least from a traditional Western viewpoint— to move away from the current functioning democracy towards authoritarianism. Given India's diversity, coalition politics is both healthy and promotes stability. More authoritarian rule could be potentially destabilizing, leading certain groups to feel marginalized and minority voices to be overshadowed.